Fall is a beautiful time in Nebraska. It’s the end of muggy summer days, and there are still a few months before snow descends. At the same time, as the wind picks up and the sky gets cloudier, fall storms make their way into the weather forecast. Stay safe with these five tips for driving in fall storms. A light breeze is not a problem, but if you’re driving on a particularly gusty day, note that the wind is stronger in open areas and can suddenly change when you enter and exit tunnels. Avoid driving close to semi trucks, trailers and other large vehicles because their size makes them susceptible to wind, and they may accidentally move into your lane. If one passes you, keep your hands firmly on the steering wheel to navigate any movement that pushes you out of your lane. Of course, both hands should always be on the steering wheel, so you can react to problems. Flip on your high beams (sometimes called brights), and then your low beams (regular headlights), and walk around your car to see that they work. You may want to have a mechanic adjust them — so they point the correct way — and replace any bulbs that have burned out. Check your fog lights, too. They are not in every vehicle and are becoming less common so, if you don’t know what your vehicle has, read your owner’s manual. Learn how to turn them on, so you don’t fumble to find them when your eyes should be glued to the road. 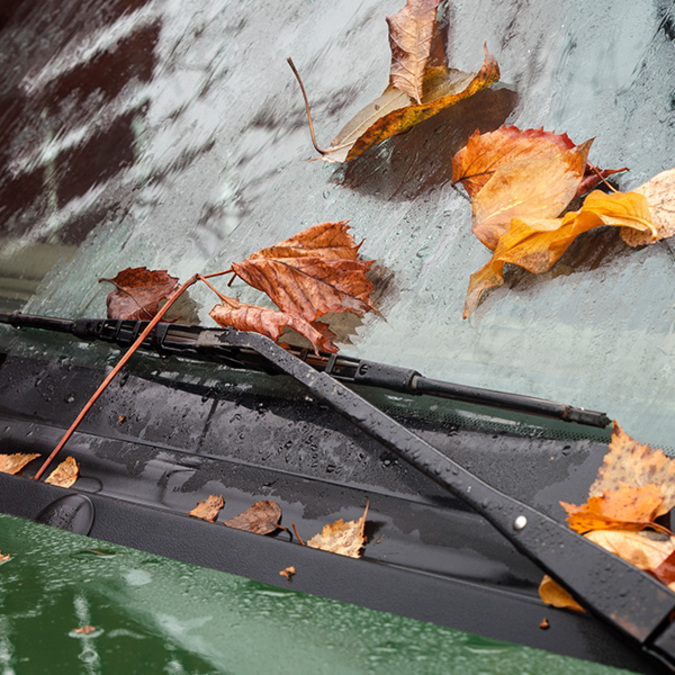 A clean windshield is essential when visibility is low during a fall storm, so wipe it down — inside and out. Check and fill the windshield washer fluid, too, along with any other car fluids while you’re at it. Additionally, polish your headlights and brake lights, so they shine bright when you need them. As for the inside of your car, make a habit of clearing it out when you get home every day or tidying the clutter when you wash your car. The less stuff you have in it, the better, so you won’t be distracted by objects rolling around when you're driving in a storm. While it’s always nice to carpool, keeping vehicles off the road is especially helpful during a storm. If you’re driving the work carpool in difficult weather, ask your co-workers to let you concentrate. With school back in session, you may be driving a car full of children, so prepare for stormy days by keeping snacks in the vehicle to occupy kids (ask other parents about allergies) and having a music or story they can listen to, so you can focus on the road. The last thing you need during a fall storm is mechanical trouble. Keep your car in good condition by regularly rotating tires and replacing them when necessary, as well as taking your car in for scheduled maintenance and tune-ups. Don’t ignore the check engine light or funny noises, as they tend to signal a problem that will get worse (and more expensive) without a repair. Visit a trusty automotive service mechanic, such as the experts at Jensen Tire & Auto , who can keep your vehicle in top shape so it can help you get safely to your destination in any fall storm. Their professionally trained associates and certified technicians offer the best tires, superior auto repair, and competitive prices at 21 convenient locations.